At first, I honestly thought that they did not have at least one Poker Table on this website! Good thing that I did not give up and tried to dig up a little bit more.I found out that you are unable to search any games through their search bar if you are using Firefox. I was typing “Poker” like crazy, even turned my computer off just to make sure that it was not on my end; I even contacted their live chat! As I was talking to their representative, I thought to try searching it through Google Chrome, there viola! Everything was there in front of me! 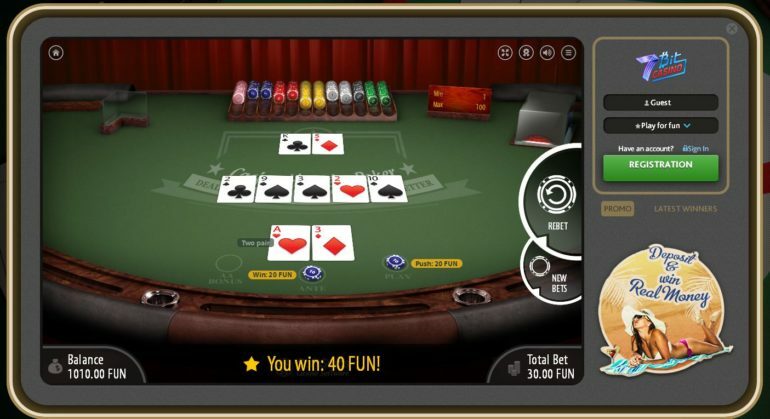 Here are the Poker Games I have found out for you under 7bitcasino.com. Oh, by the way, did I mention that they offer FREE PLAY? Cool, right? Once you have chosen your Ante just click on DEAL and the dealer will give you two cards and three cards in the middle faced-up. At this point, you will be able to RAISE or FOLD. Of course, when you choose to Raise, you need to double up your original Ante. For our sample screenshot above, you can see that I added $20 on the table because my original Ante was $10. 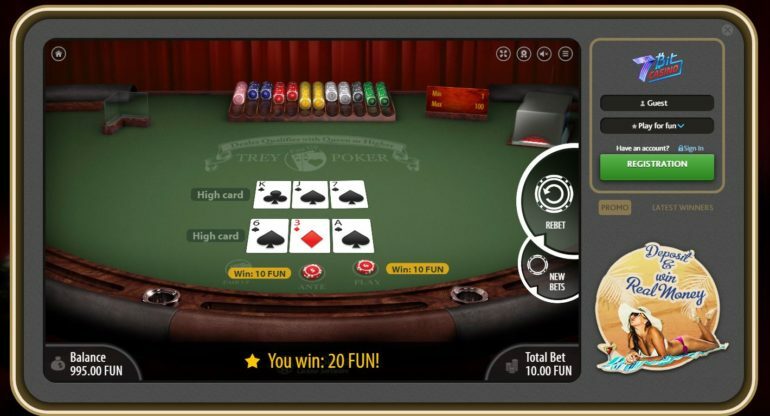 In Trey Poker, the game is straight forward. You get three cards. It’s either you PLAY your hand or you FOLD it. Of course, if you PLAY, you need to put up your Ante and add additional bets on the table. Choosing FOLD will forfeit your original Ante. Caribbean Poker plays exactly like Oasis Poker which is mentioned above. The only difference is that you are unable to remove cards from your hand and exchange them for a price. 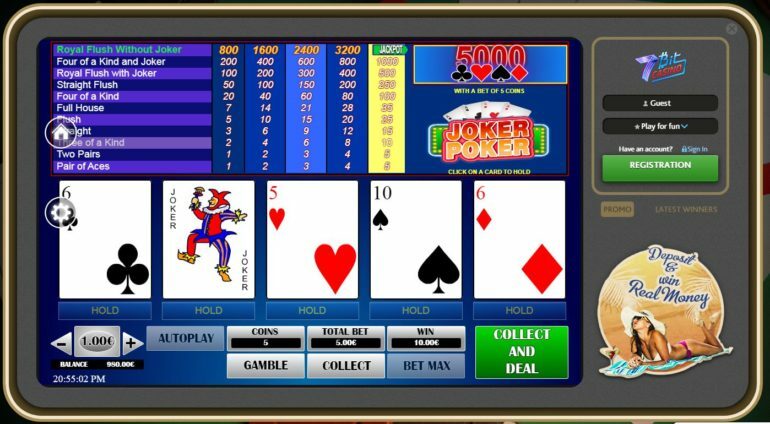 The Joker Poker game found in 7bitcasino.com is a classic video poker game. All you need to do is choose your bet and click on how many coins (odds) you want to play with. The larger the number of coins, of course, the larger the winnings! 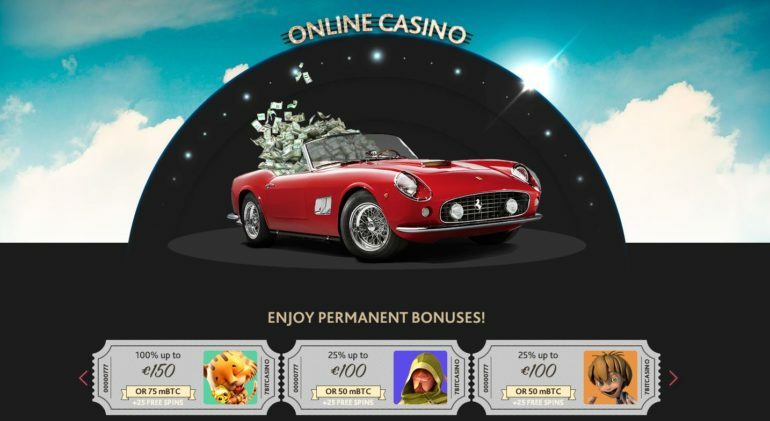 7bitcasino.com has also Bonuses offered. You can view their current promotions here. You do not need to register an account with 7bitcasino.com to try out their games. That’s a plus right there. Why would I waste my time in creating an account for a website that I would not be spending that much time at? The only downside for this website is that it is not user-friendly. I had to figure my way around the website just to find games slightly connected to Poker. They do have a large selection of games to choose from and that is always a plus when it comes to online casino websites. Just like any other websites out there today, it would be best if you try them out yourself. If you think that the website is great, then give it a shot!